Diagrammatic reasoning is your ability to think logically and solve complex problems. It's a measure of your inductive reasoning and deductive capacity. A diagrammatic test is designed to assess your ability to identify a set of rules from a flowchart or sequence of diagrams, and then to apply those rules to a new situation. How do diagrammatic reasoning tests work? Diagrammatic reasoning tests are designed to evaluate your ability to solve problems and think logically. Your task is to deduce the underlying logic of a pattern and guess what is next to follow. You are presented with multiple options and have to choose which one fits. To do this, you’ll need to view the shapes to find rules which can be applied across the sequence. Try a practice diagrammatic reasoning test. Why use a diagrammatic reasoning test? 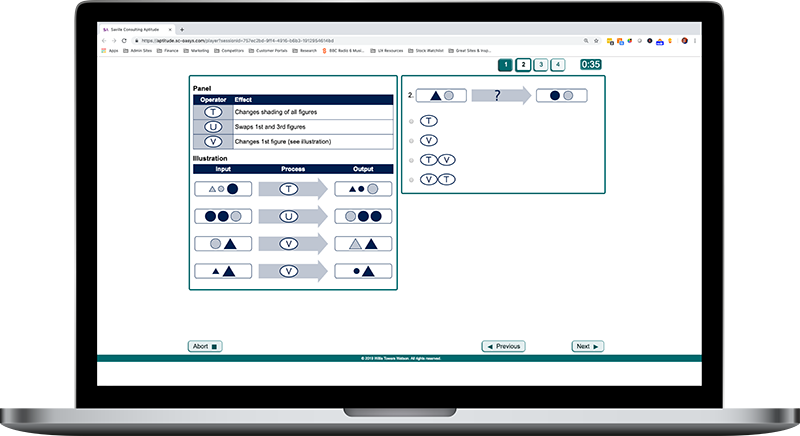 Diagrammatic reasoning tests are a great way to assess candidates capacity to solve complex problems. This can be important for many technical roles, such as production workers, apprentices, engineers, designers and scientists. This 24-minute test assesses the ability to evaluate processes represented through diagrams. It is designed for all high-level roles, e.g. directors, managers, professionals, graduates and management trainees. Try a practice diagrammatic analysis aptitude test. This 16-minute test assesses the ability to evaluate processes represented through diagrams. It is designed for all technical roles, e.g. production workers, apprentices, engineers, designers and scientists. Try a practice diagrammatic comprehension aptitude test.